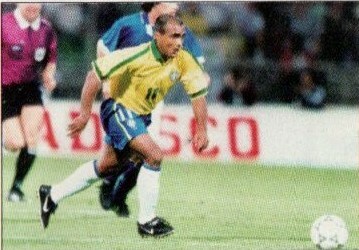 The Third and final matchday took place on June 10th with Brazil facing England at Paris‘ Parc des Princes. England were unexpectedly in a position where they were already champions irrespective of the other results. Nevertheless, both teams were eager to end the tournament on a positive note. 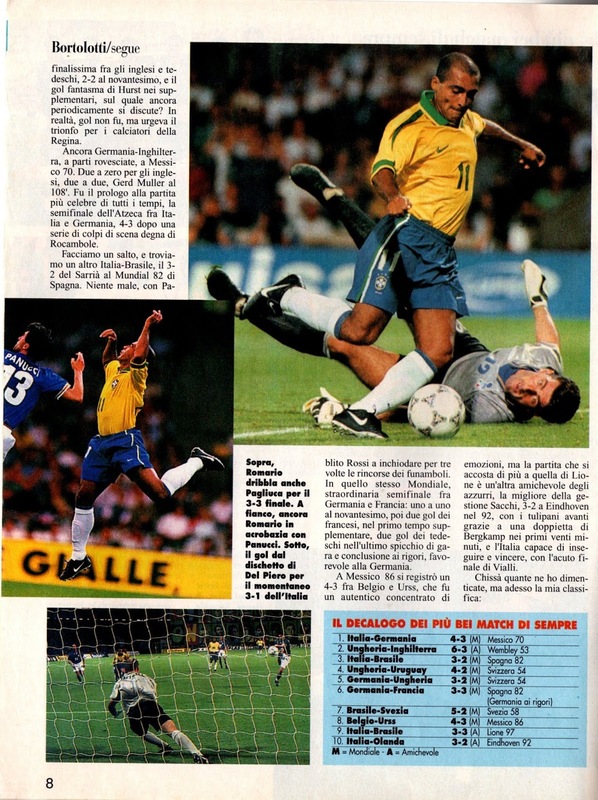 Amazingly, only England had thus far earned any wins and Brazil had to win as a matter of pride. England were missing David Beckham who was suspended due to yellow card accumulation. Hoddle made other changes as well. 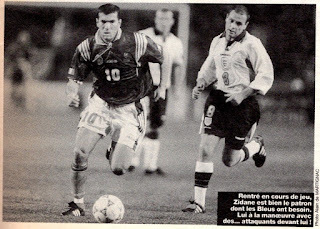 Martin Keown was back in defense in place of Gary Neville. In midfield, Scholes and Ince came in for Beckham and Batty. 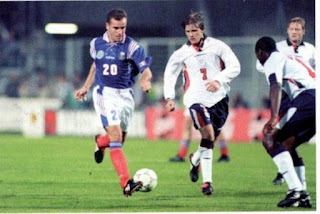 While in the attack, Sheringham started ahead of Ian Wright. 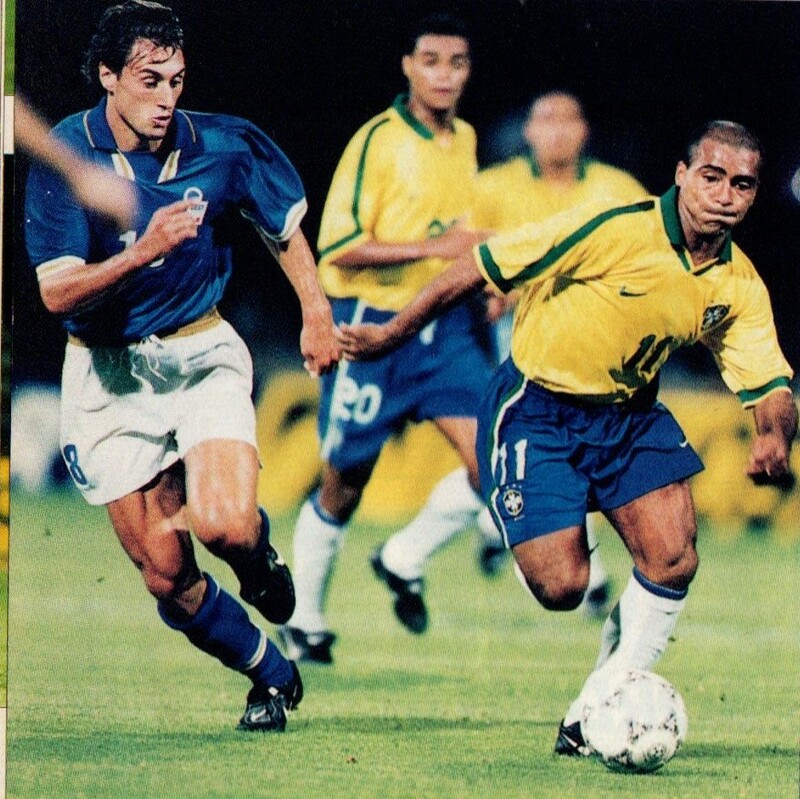 Brazil’s only change was Flavio Conceição’s inclusion in midfield ahead of Mauro Silva. England made a positive start and were better in the first half hour. 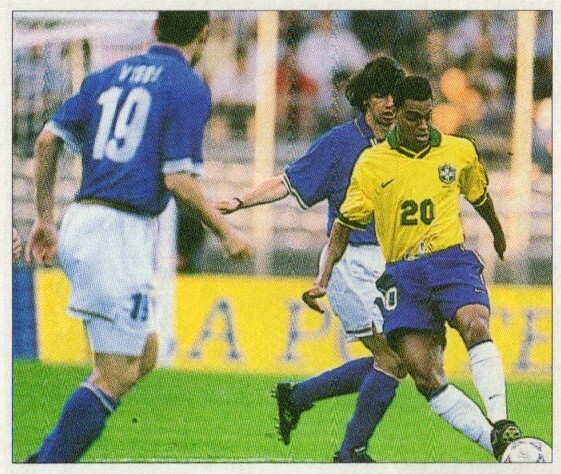 Brazil lost Denilson to injury as early as the 22nd minute and was replaced by Djalminha. The English themselves lost Keown to injury couple of minutes earlier and Gary Neville replaced him. 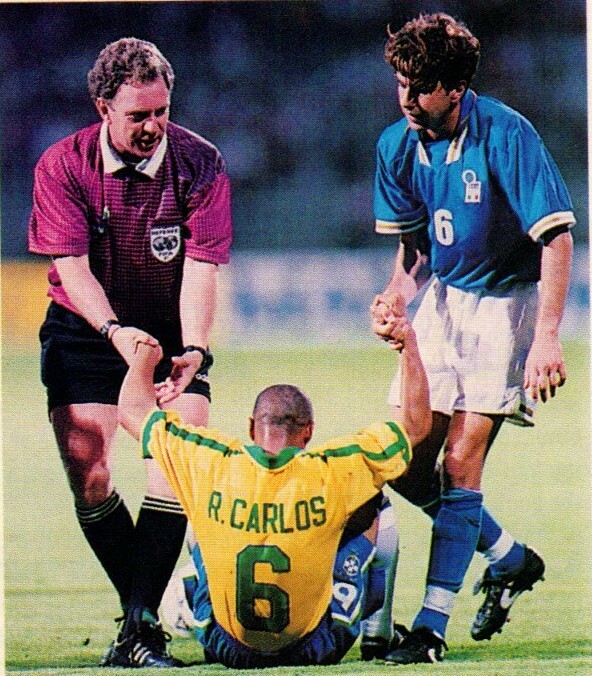 Brazil would push through and take the lead in the 61st minute; Romario slipped the ball past Seaman after he was put through by Leonardo. Hoddle gambled on the double substitution of Robert Lee and Ian Wright (replacing Scholes and Sheringham) with a quarter an hour left. Ronaldo had a relatively quiet evening as Brazil held on to the lead for and ended on a high note despite not winning the Tournament and settling for second place. 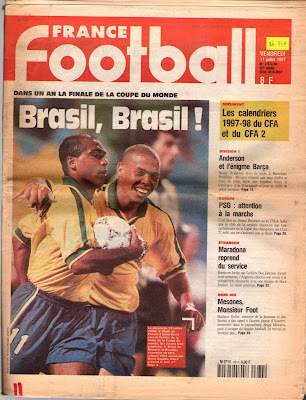 Brazil now set their sights on the Copa America within a weeks time and Zagallo had a backbone that he could work with for the Copa. One of the observers, Jamaica Manager, the Brazilian Rene Simoes, praised England afterwards and noticed improvements in their possession game. 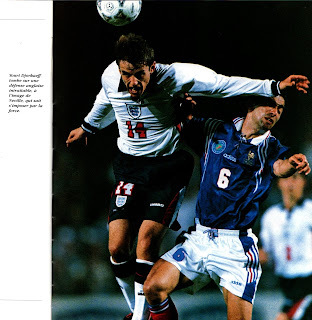 England did however struggle in some phases with the likes of Le Saux and the double strike force of Shearer and Sheringham not firing on all cylinders. 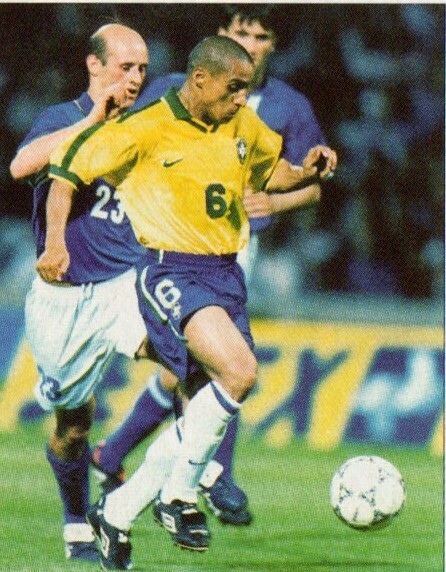 Phil Neville remarked the difficulty in handling Brazil’s strikers. 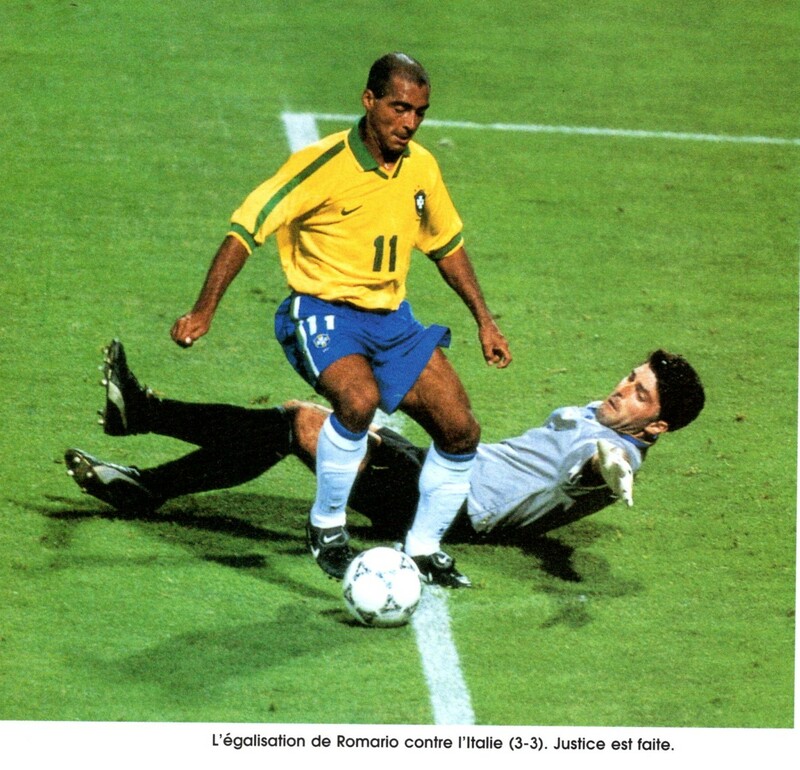 He said when you stop Ronaldo from scoring, Romario steps up. He felt it was impossible to stop one or the other simultaneously as they combine well together to place their opponents in difficulty. He described them as the best strikers in the World. 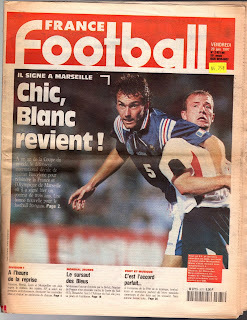 Hoddle expressed happiness to have won this Tournament, but was even more satisfied for their performances in general. He also stressed that qualification to the World Cup remained the most important objective. He stressed that they had been undefeated and this match vs. England had met his expectations in all the sectors of play. He stated that in space of a week his squad had modified its tactics and manner of playing to perform even better. On the following day, June 11th at Paris‘ Parc des Princes, the French hosts closed the Tournament vs. Italy. 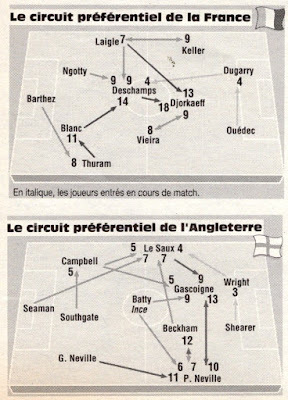 Jacquet once again made eight changes to his lineup (Thuram, Deschamps and Dugarry kept their places) and opted for a 4-4-2 formation. 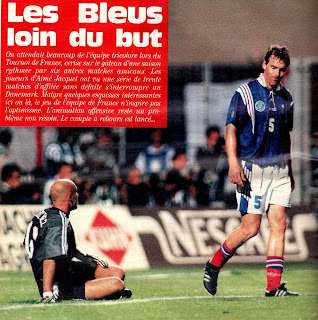 Fabien Barthez was injured, therefore Lionel Charbonnier started in goal, making his International debut for France. 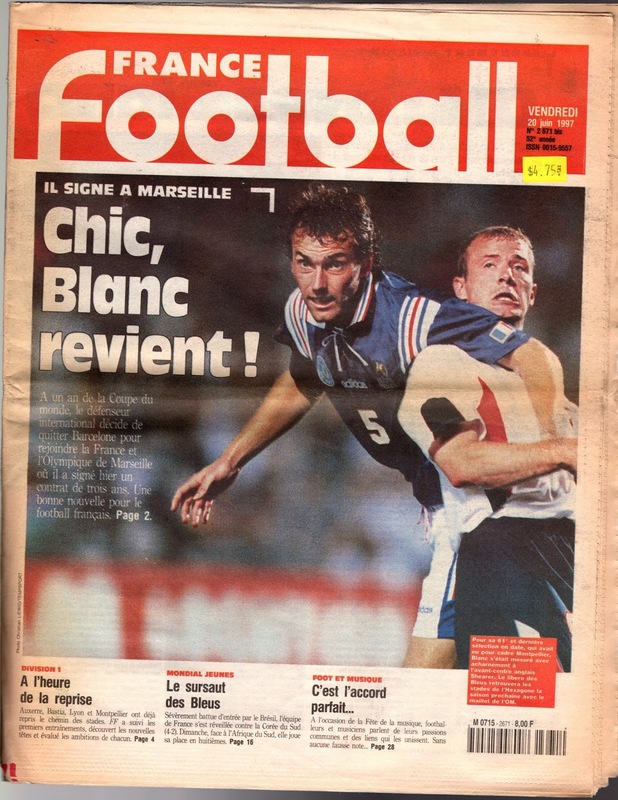 In defense, Leboeuf, Desailly and Lizarazu came in for N’Gotty, Blanc and Laigle. 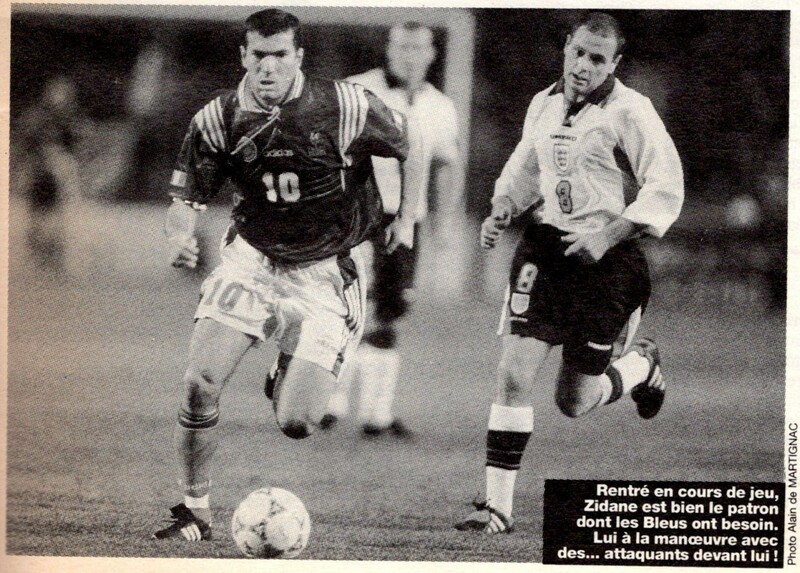 Once more Jacquet had preferred not to start with Zidane and Djorkaeff together, as Zidane was back organizing the play instead of Djorkaeff. Karembeu was also fit and back in the side replacing Vieira, while Ba was back operating as false winger on the right side (replacing Keller). Florian Maurice was back in the attack instead of Ouedec. 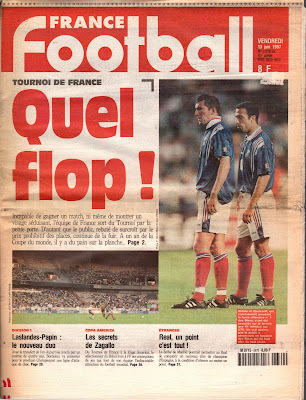 As hosts, it was imperative for the French to earn a result from this match. 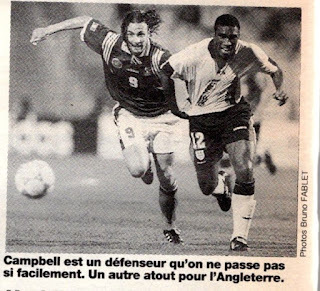 Desailly had remarked as much saying given France’s position, France had more to lose than Italy. Jacquet continuously stressed that he was experimenting and that the results were not important at this stage, but to be ready in a year’s time. 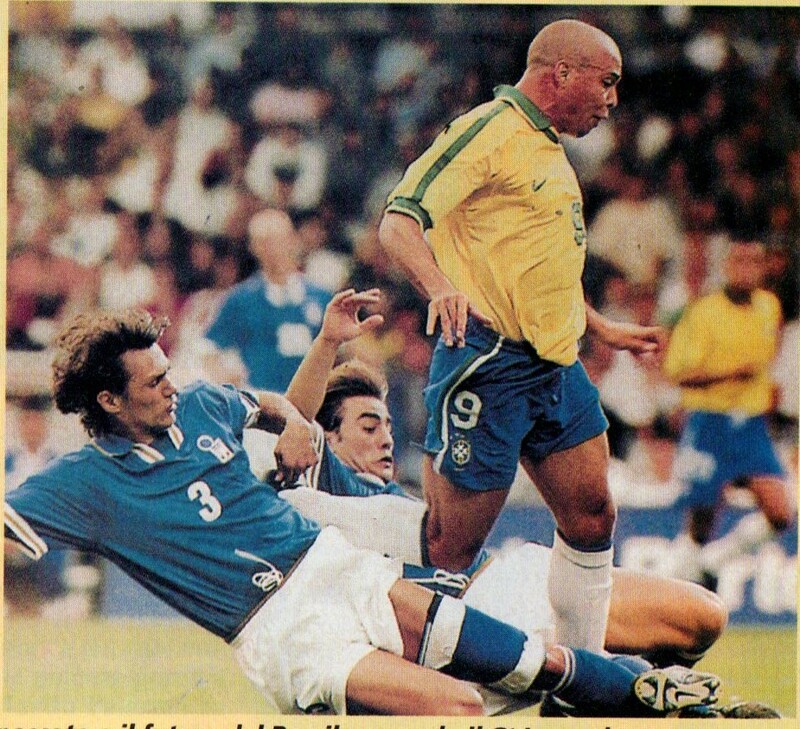 The Italians buoyed by the success of their display vs. Brazil made four changes. 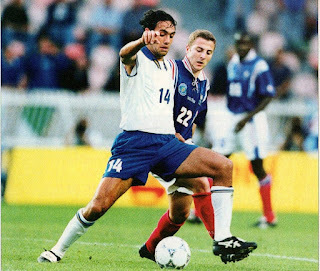 In defense, Alessandro Nesta came into the side replacing Panucci. Di Livio and Zola came back in the side replacing Dino Baggio and Albertini (scheduled for an operation back home and thus unavailable). Casiraghi came back and replaced Vieri up front. France would take the lead in the 12th minute. 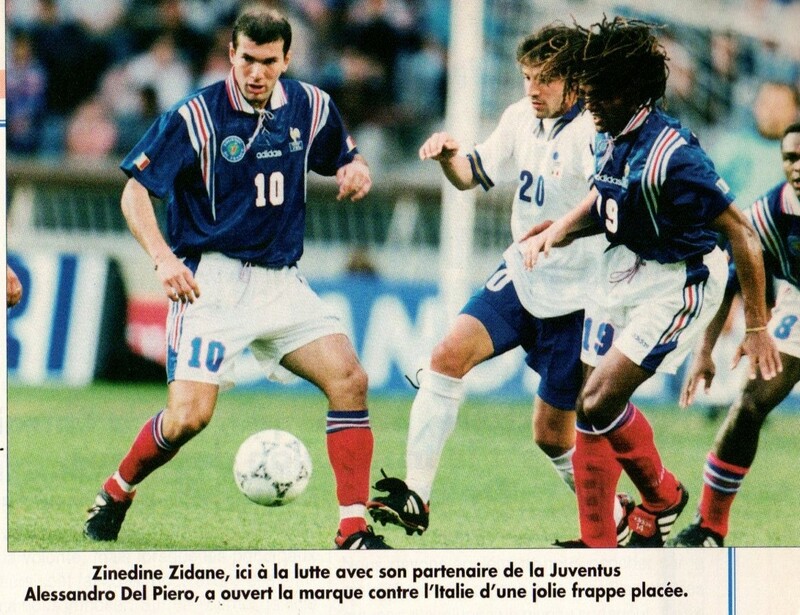 Thuram’s long cross was controlled by Zidane and volleyed to the top of the goal from a narrow angle. France would hold onto the lead into halftime. In the second half, Torrisi replaced Costacurta in defense and ten minutes into the half, Panucci came in for the disappointing Zola. In the 61st minute, Italy tied the match when Casiraghi headed in a cross from Di Livio. 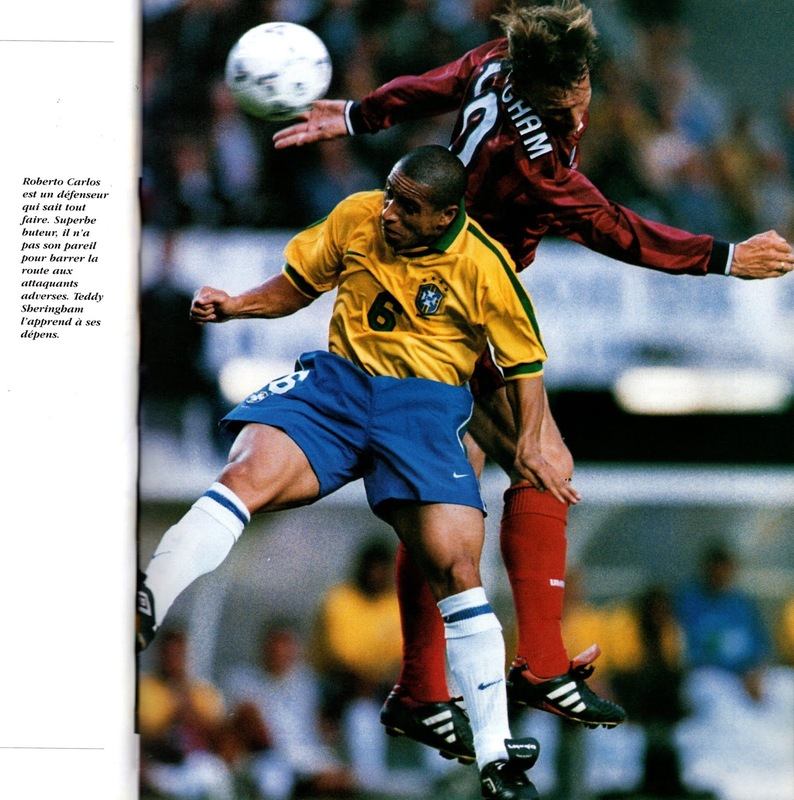 Minutes later Jacquet replaced the struggling Karembeu with Vieira and also sent on Djorkaeff for Maurice. 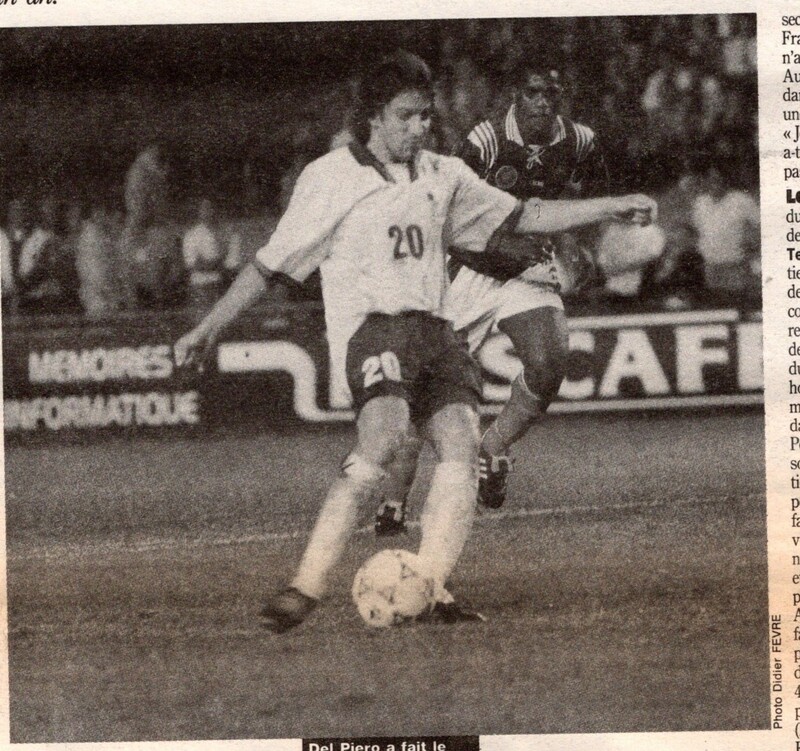 In the 72nd minute, France took the lead when Djorkaef unleashed a powerful unstoppable long distance shot. Cesare Maldini decided to send on Vieri to replace Casiraghi at the top. 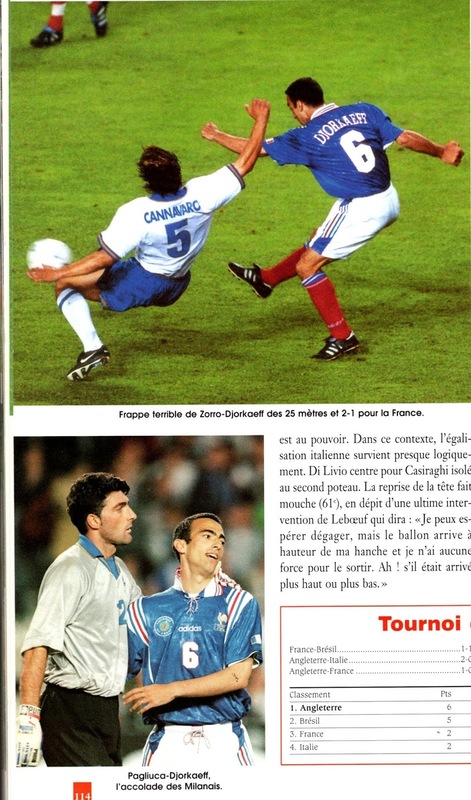 Just as it seemed France were headed for a win, Italy were awarded a penalty kick in the last minute after Thuram fouled Del Piero in the box. 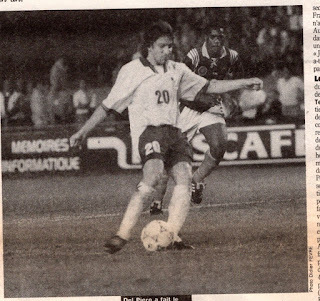 Del Piero stepped up to score his second penalty kick of the Tournament and third goal overall (top scorer of the ‘Tournoi’). For the French, Dugarry had a disappointing match and only Djorkaeff’s wonderful strike was a point of satisfaction for France. A dejected France had failed to win. The only consolation was that at least they did not finish dead last as they had a better goal difference than Italy. In the end, Jacquet once again stressed the fatigue of his squad. Lizarazu echoed this and said the last ten minutes of the match were very grueling. Despite the disappointing end, Jacquet preferred to look at the bigger picture. He stated, “Now we have 12 months to get it right”. Jacquet also underlined how indispensable Zidane and Djorkaeff were to his plans. Italians were relieved as they had salvaged a draw from the jaws of defeat and in any case they had improved since the dismal performance vs. England. 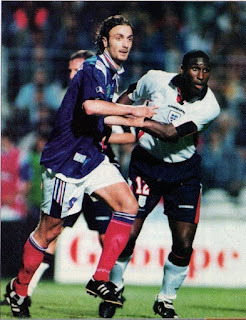 On June 7th at Montpellier’s Stade de La Mosson, France hosted England for the second round of matches. Jacquet proceeded to make eight changes from the first match. 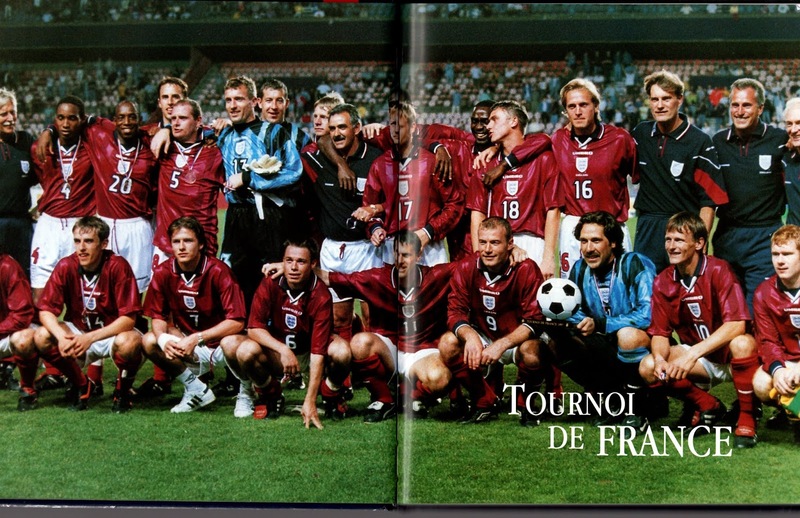 Only Barthez, Blanc and Deschamps kept their places. Jacquet reshuffled his squad due to fatigue and experimentation needs and deployed a 4-4-2 formation. Thuram, N’Gotty and Pierre Laigle were called up in defense replacing Candela, Desailly and Lizarazu. Vieira and Djorkaeff came in to replace Karembeu and Zidane. Jacquet deployed Djorkaeff in the Zidane role as the midfield organizer just behind the two strikers. Up front Keller (as a false left wing), Ouedec and Dugarry came in for Ba, Maurice and Pires. 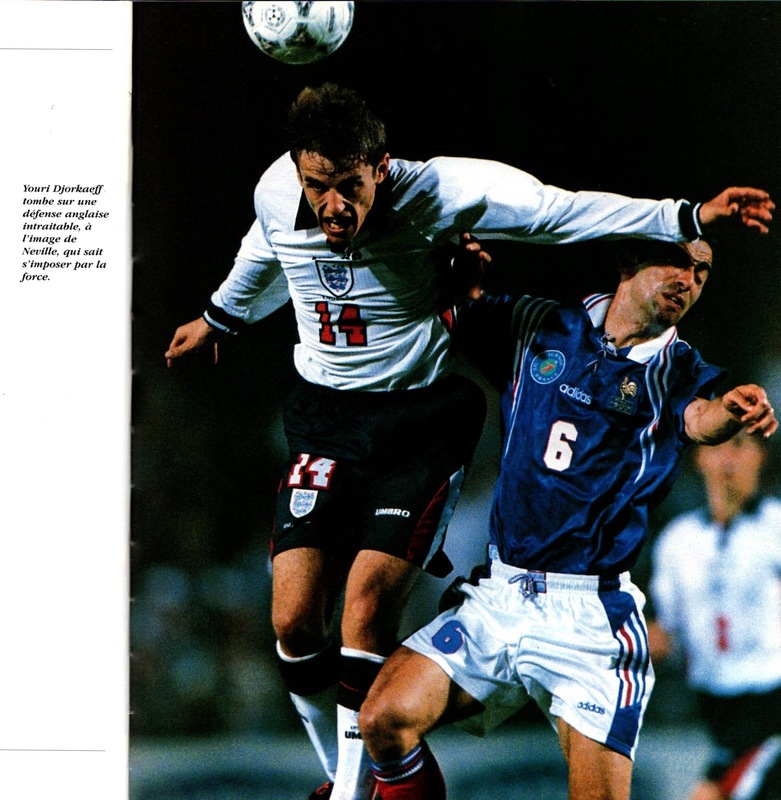 Glenn Hoddle also rested players and only five players from the first match kept their places (Southgate, Phil Neville, Beckham, Le Saux, Wright). 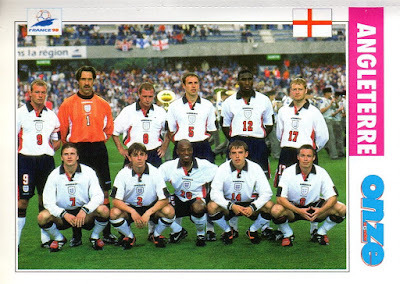 David Seaman started in goal for England (replacing Tim Flowers). In defense, Sol Campbell and Gary Neville started ahead of Keown and Pearce. 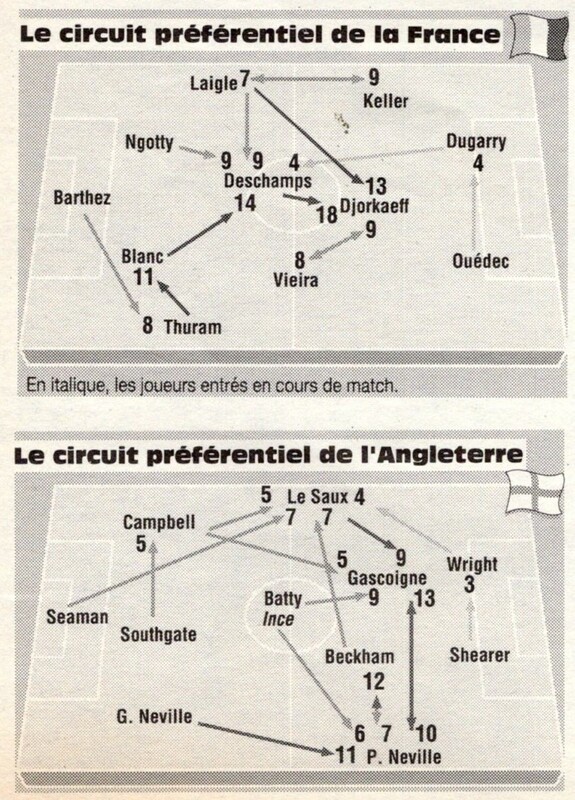 In midfield, Gascoigne and Batty started ahead of Scholes and Ince. Up front, England Captain Alan Shearer made his debut in the Tournament replacing Sheringham. 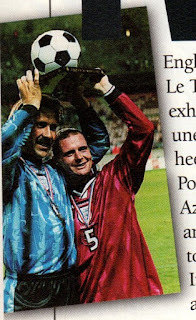 It was a match where both sides had opportunities with both goalkeepers Seaman and Barthez saving their side on numerous occasions. 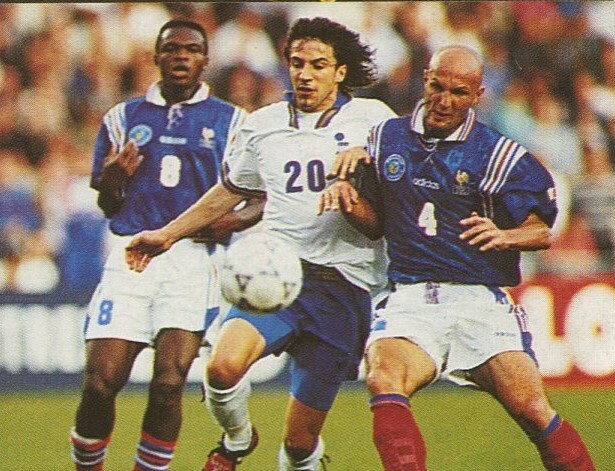 France still struggled in the striking positions with Ouedec being just as ineffective as Maurice from the previous match, though Dugarry was adequate. Patrice Loko’s entrance as a replacement from fellow striker Ouedec made no difference. This would be the last cap ever for both Ouedec and Loko. 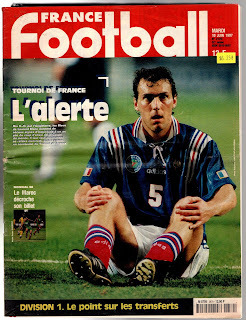 Djorkaeff struggled in his new role and lost too many balls and rarely distributed passes to Ouedec and Dugarry. Jacquet would later blame fatigue for Djorkaeff’s inability to adapt to the role. Zidane’s entrance in the last quarter hour pleased Djorkaeff, who later credited his entry for bringing more fluidity to the side. 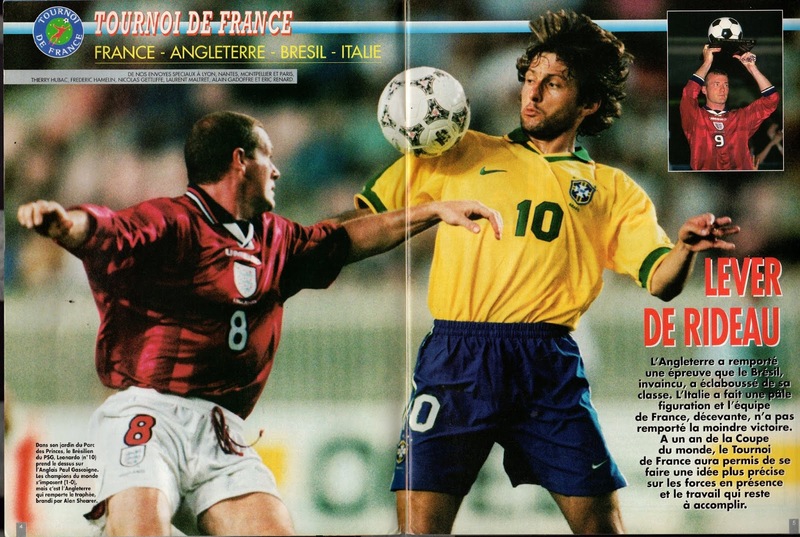 He went on to say that he functioned better with Zidane at his side, as they both know each other’s movements. For the English Gascoigne was a major disappointment as he was still struggling with injuries. He lost possession too many times during the match. 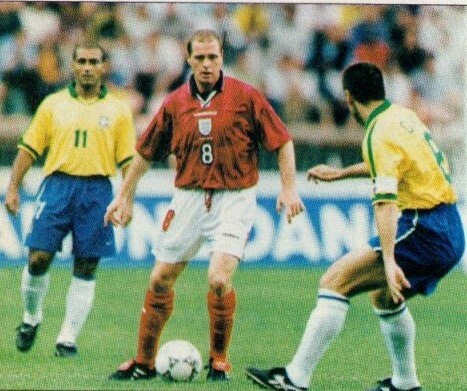 David Batty also struggled for the English and was equally disappointing. He would be replaced in the second half by Ince. 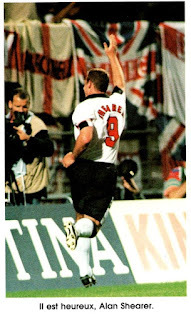 In the end it was a mistake, near the end, by the nearly faultless Fabien Barthez that gifted England’s winner. He failed to hold onto late substitute Sheringham’s low cross and the opportunistic Shearer knocked in the loose ball from close range. 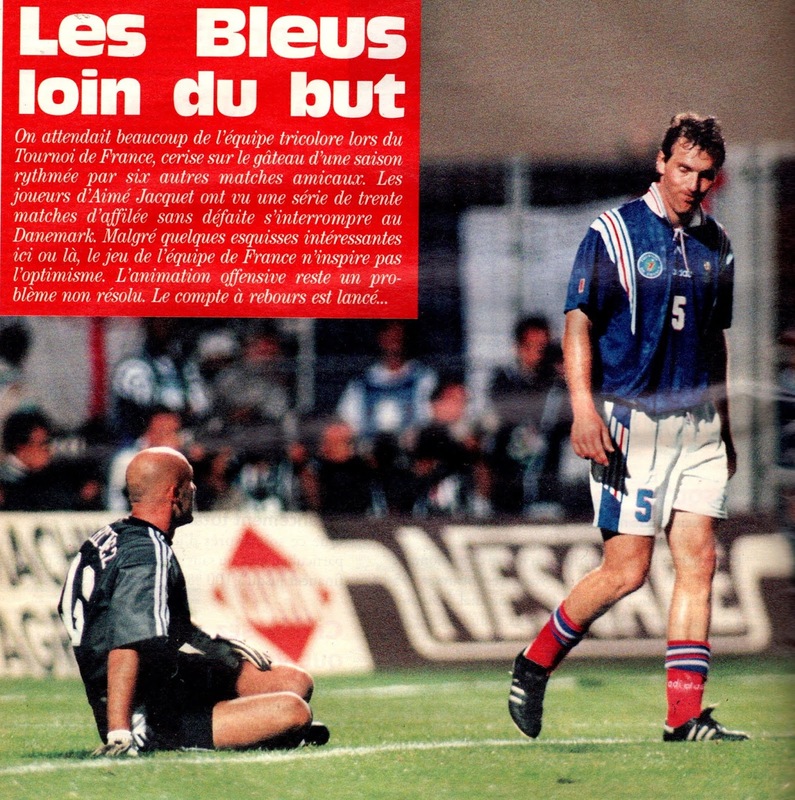 France lost for the first time at home since that fateful World Cup qualifier vs. Bulgaria on November 17, 1993. After the match, Didier Deschamps believed France’s strength was still its defensive strength. He believed it was good to find a solution in the offensive part and be more spectacular but France must not lose its defensive solidity in the process. The consensus from most observers after the match was that Djorkaeff was more useful up front rather than in the Zidane role. Jacquet was fully aware that the veterans did not like fiddling with the squad and wanted a more settled side. He defended his tactics by saying, “I wanted to look at a variation I had been able to try only once before and for which I will have very few further opportunities. What’s important is that the team is ready for next year, not this year. We are still evolving”. He believed the tactics employed could have worked with fully fit and rested players and lamented and wished he had had at least 10 days to prepare the side. 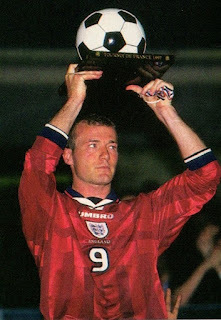 Hoddle would describe his captain Shearer as a ‘diamond’ on the field. 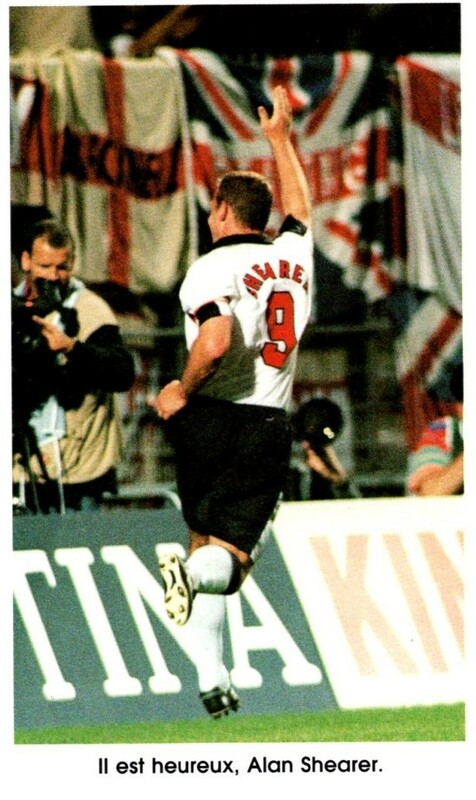 He insisted his goal was not due to luck but it was the striker’s insistence on scoring that mattered. He also expressed relief that Zidane-Djorkaeff combination was on the field for a very short time. Hoddle stressed how they had been ranked as outsiders, but were now in the best position to win the Tournament. Furthermore, he stated that they did not have to prove anything to anyone; they had simply come to find pleasure and build a positive state of mind for their future endeavors. On the following day on June 8th at Lyon’s Stade Gerland, Brazil took on Italy in a replay of the 1994 World Cup Final. This match would not only go down as the best match of this Tournament, but also as a classic in the history of the game and is often referenced. The seesaw aspect of this match only enhanced its status. 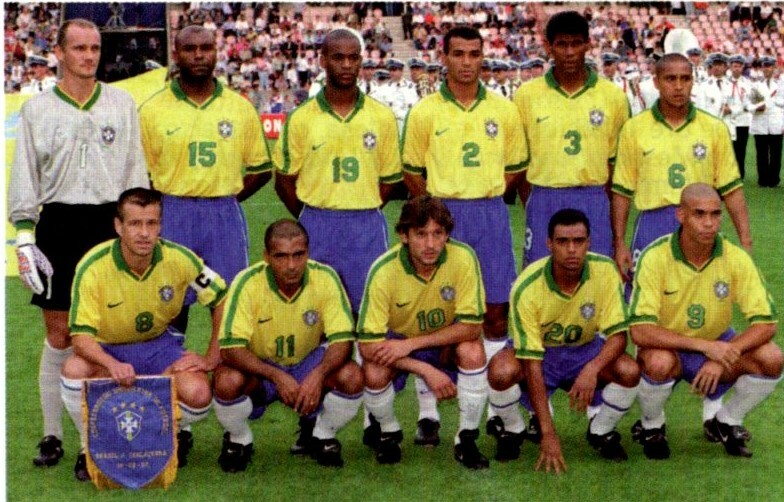 Brazil only made one change form its match vs. France. Teenage sensation Denilson started ahead of Giovanni. Once again Italy’s Cesare Maldini had opted for a 4-4-2 formation. He made six changes from his previous lineup. Gianluca Pagliuca started in goal ahead of Peruzzi. In defense, Captain Paolo Maldini was back in the side along with Christian Panucci, as Ferrara and Bennarivo made way. 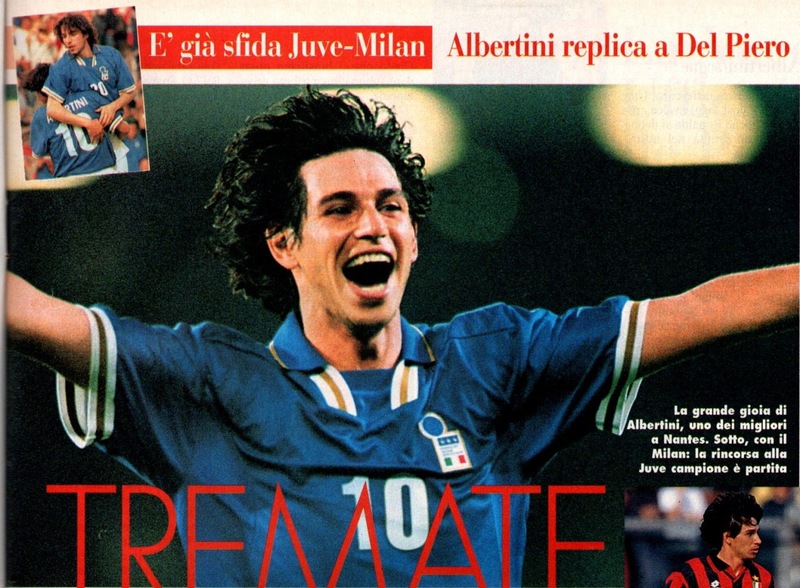 Attilio Lombardo came in Di Livio, while the young strike force of Christian Vieri and Alessandro Del Piero replaced Zola and Casiraghi. 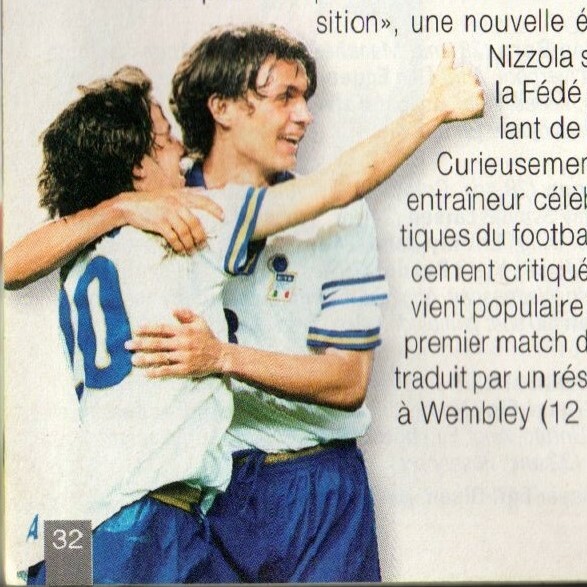 In fact, it was the two youngsters who combined for Italy’s opening goal in the eighth minute. On the right side, Vieri turned and crossed into the box for Del Piero to head past Taffarel. 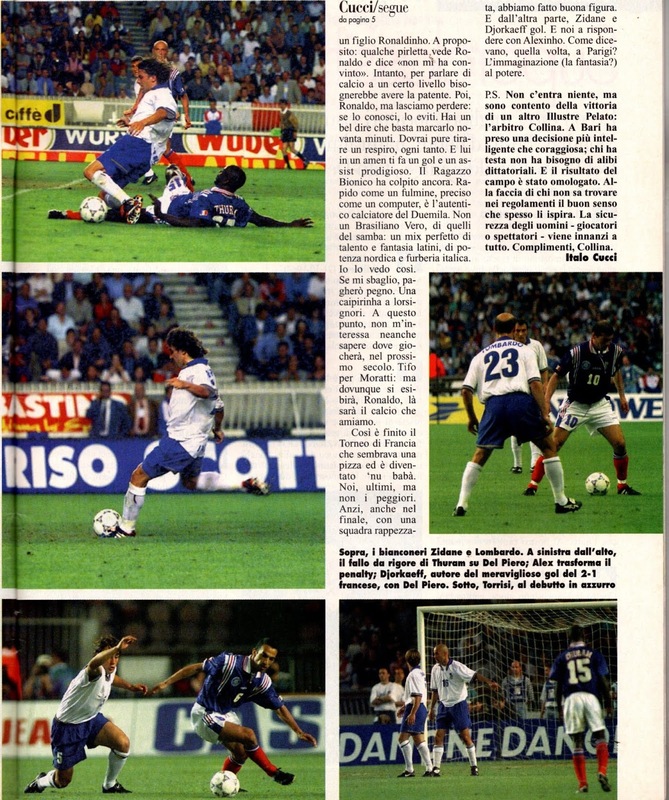 Italy were more enterprising in the early going and soon doubled their lead in the 23rd minute, when a quick free kick by Albertini was deflected past Taffarel by Aldair. 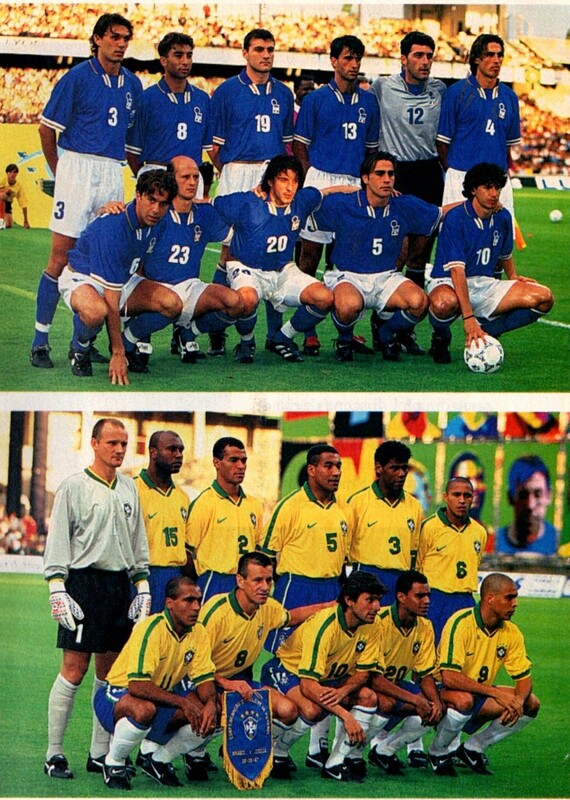 At this point Brazil seemed in disarray, but gradually clawed their way back. In the 35th minute, Brazil reduced the deficit, when Lombardo deflected Roberto Carlos’ low shot into his own net. Early in the second half, Cesare Maldini sent on Fillipo Inzaghi in place of Vieri, The Serie A Capocannoniere soon made his presence felt, when he drew a foul in the box from Aldair. 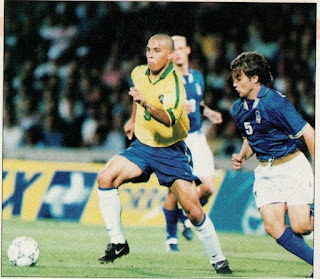 Del Piero scored from the spot to restore Italy’s two-goal cushion. 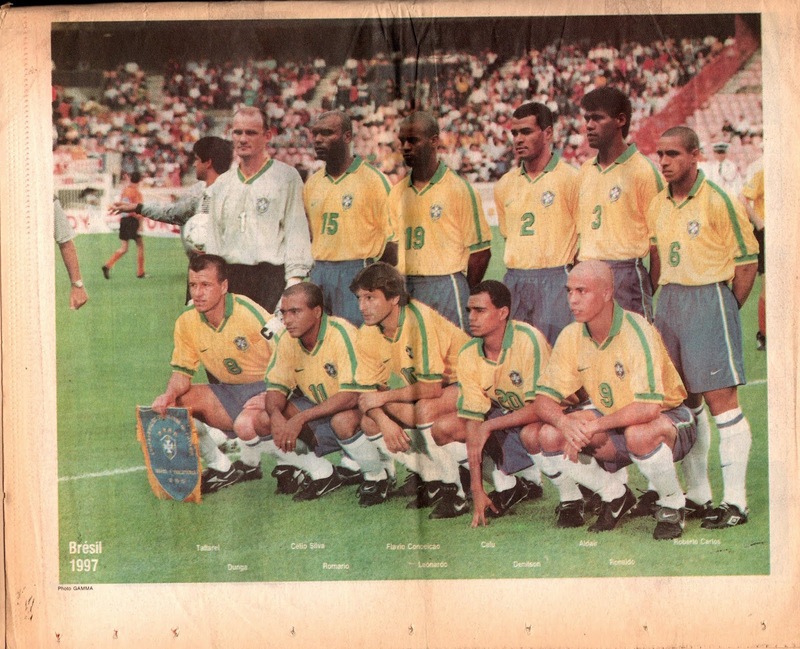 Zagallo would replace Mauro Silva with Flavio Conceição at this point. Just as it seemed Brazil were finished, the Ro-Ro combination would spring to life to make this match a memorable one. 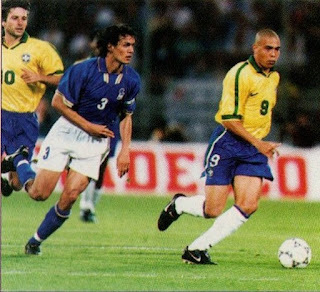 In the 72nd minute, Ronaldo grabbed a pass in a narrow space in the box and somehow managed to go around Costacurta and shoot past Pagliuca. 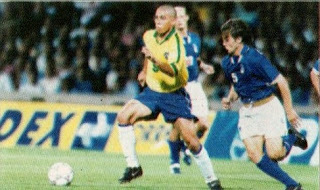 There were minutes remaining, when Ronaldo fed the ball to the onrushing Romario who scored the equalizer for an emphatic (3-3) score. Brazil had unearthed a new star in Denilson, though their defensive frailties were exposed (that would continue until the World Cup itself). Taffarel, Cafu and Aldair had a disappointing match, while Flavio Conceição was now threatening Mauro Silva for his position. 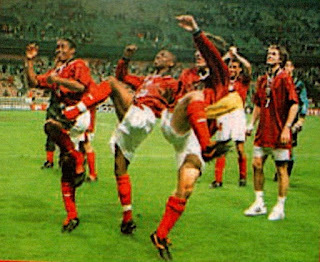 For the Italians, Del Piero had been the pick of the bunch, but in general the entire squad had received a morale boost after their dismal performance vs. England. After the match everyone who witnessed it was wax-lyrical about it. He once again reminded how tired his players were against England and in between these matches he had to recharge the batteries of some of the players. He compared Italy to Germany, saying they can be criticized and derided but always respond when the time comes. 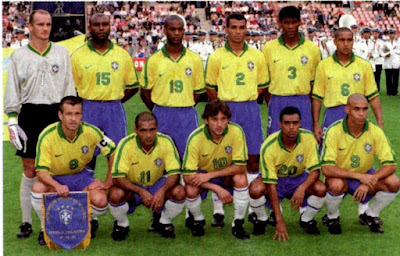 Former Brazilian great and Manager, Paulo Roberto Falcao, working for Rede Globo stated, “Especially in the second half, in these 45 minutes my compatriots played at a level that I found remarkable. I really appreciated their reaction and the manner that they employed to get back the score against an Italian side that also surprised me”. 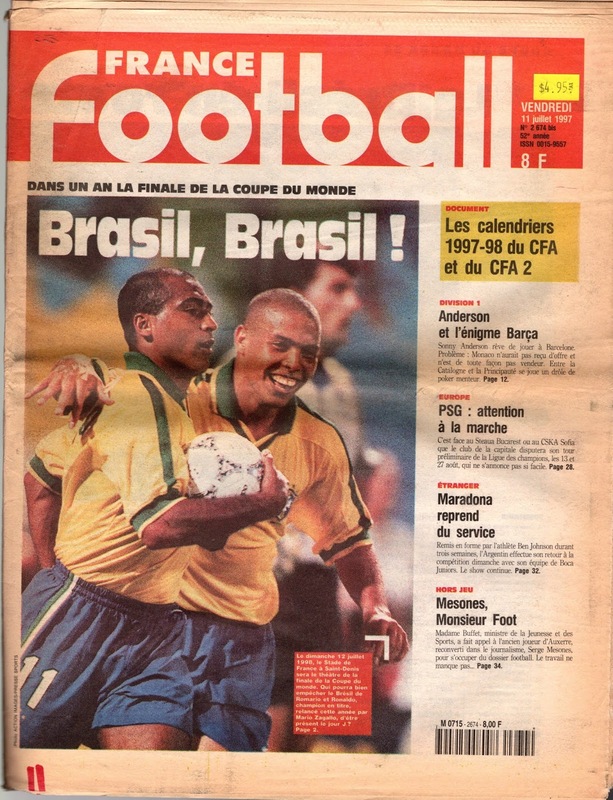 Falcao played down the comparison with the 1982 match, he said, “That is not comparable, the 1982 match had another dimension, here it was a friendly Tournament. 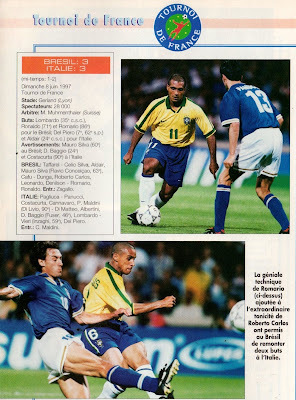 The teams were prestigious but there wasn’t the pressure that is present in a World Cup”, he added, “Brazil must attack, but that does not depend on only its strikers, last week (vs. France) in the second half we found the ideal balance. And when the team reaches this level, I do not know if there are many teams that are at its level”.